If you subtract out Sundays in the month of April it leaves you 26 days, which is the same amount of letters in the alphabet, A to Z. Starting on the 1st you begin with the letter “A” and blog about something that begins with the letter “A”. This continues through the 30th of the month ending with the letter “Z”. In 2010 when this was started, the blogger turn out was about 100. Now in 2015 you can expect over 2000 (my guesstimate). So even if you are not a blogger, you can find a lot of new blogs to follow! Some bloggers like to follow a theme throughout their posts, and some just like to wing it! Either way you decide to join in is okay. Last year, we just wrote about an array of dog stuff, but this year we have a theme. So now for the big A to Z Theme Reveal! What a fun month we have up ahead! Even if you’ve never had an obedience lesson we will help you there too! We will be trying a few new things including tutorials, downloads, videos and a super cool giveaway! So be sure to follow us by subscribing to our email list. 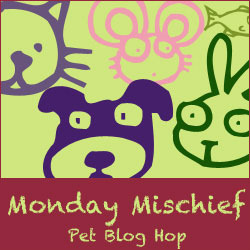 Today we are once again joining Monday Mischief. If you were wondering what we were up to this weekend? Well Riley and I are in the process of getting ready for this super awesome A to Z Challenge! What fun! Is there a linky list for dog bloggers? There was last year, and that’s one of the main reasons I decided to join. My theme this year is All-positive! I’m not too sure… I know there was a list last year. Great theme – best of luck to on the A to Z Challenge! I have a friend who does agility with her kesshonds so I look forward to reading your posts! I’ve never heard of the A to Z challenge, but that’s pretty interesting. I’d love to learn more about agility! I love your A-Z Challenge theme! I’m doing it too, this year, for the first time. My theme is focused on wild, odd and rare animals. I’ve got some completed and waiting for April. I just hope I can keep up! Thanks for sharing. I look forward to reading your posts on Agility. That sounds like a really cool theme and thanks for the heads up on it – love the graphic, btw. Love agility. I look forward to your posts! I signed up my pet blog and am going to finsih out my series on dog foods and mixed breeds. I also signed up two food blogs, so I will be busy!!! I’m excited to read and follow along with you! Rosa would love agility training and I’ve often thought about getting involved in this with her! Oh how exciting – I can’t wait to read more about your agility!! 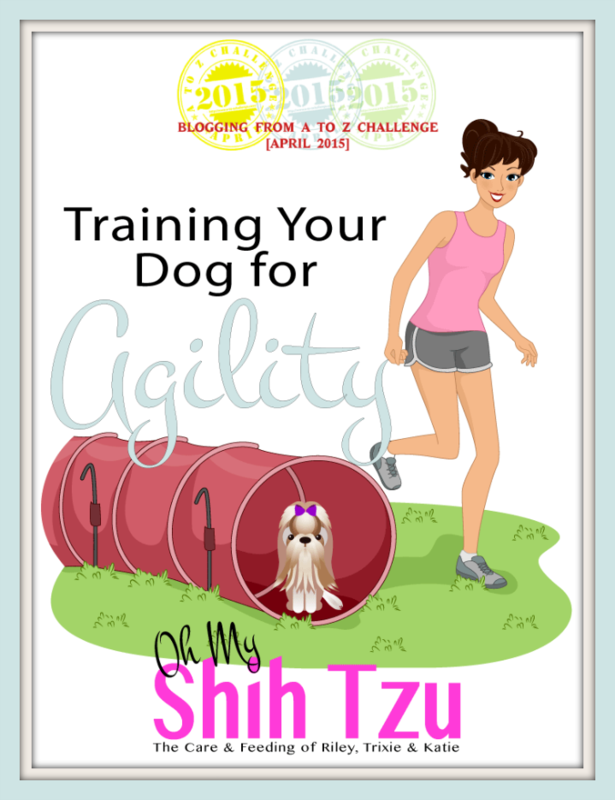 Shih Tzu + agility = total fun! Hmm, interesting. I participated in Blogtober last year and it was a good writing exercise but I wasn’t always happy with the published posts. I even considered deleting some because I didn’t feel they measured up to my usual quality. I guess I’ve got about a week to think about it and plan it out. I’ll be checking in on your posts, sounds like you are looking at some sources I haven’t explored. We’re hoping to compete for the first time in May, so maybe we’ll pick up a last minute tip. We’re going to do the A-Z Challenge this year too…although we don’t have a set theme…just CATS! For A – we plan to talk about cat agility… and we’ll look forward to reading your posts next month. Cat agility? that is awesome! I can’t wait to see it! I am preparing for a big move so I doubt I’ll be able to participate, but who knows! I love the theme and look forward to reading the posts even if I can not participate. Very interesting topic for the A-Z challenge! I’ll be sure to follow your posts & videos! Barbara Rivers recently posted…International Puppy Day ~ Don’t Support Puppy Mills! I’m really looking forward to more of your agility posts! Looks like fun! I hope you enjoy the A to Z challenge. I think your topic is a great one, from agility to zoom. WHOOPPPIEEEE!!! Can’t wait – we hope to join, and agility is just our topic!!! Woofs from Earl, Ethel and I at Earl’s World! Earl Lover recently posted…Can Dogs Develop Monday Blues? Really looking forward to it! I’m getting prepared too. I won’t have a theme since I want to talk about too many topics, but it’ll be fun. We hope to start doing agility soon, so I’ll definitely be stopping by! Jessica Shipman | Beagles and Bargains recently posted…WellyChef Birthday Burgers for Dogs + GIVEAWAY! Cool challenge! Love the graphic by the way. A to Z with a theme. We always are a “wing it” since my blog is my diary and you never know what life will bring. However, this year the Human has plans that may preclude my joining. April is sneakin’ up fast! Hawk aka BrownDog recently posted…Is It or Isn’t It? Have a great time everyone with the challenge this year. Here in Doodleville, my challenge is a new puppy, and that’s more than enough for me right now! Looking forward to keeping up with everyone. Great theme! We have a Malti-poo mix who could benefit from training. Have fun! This is a great theme! So glad that you’re joining in 🙂 It’s going to really bring you some great traffic down the line as you rank for these terms! Sounds like fun, can’t wait to see what you come up with!